Credit: Photo courtesy of C. Rohwer. WASECA, MN – Nonreflective plastic mulches have been shown to increase early and total yield in tomato, benefits most often attributed to increased soil temperatures that enhance roots' ability to assimilate nutrients such as phosphorus, a vital contributor to increased yield. Phosphorus- (P) or nitrogen- (N) and phosphorus-containing water-soluble fertilizers applied at transplant have also been recommended to improve establishment and enhance yield of annual vegetables. A new study supports the use of both practices for tomatoes grown in clay loam soils in Minnesota. Charles L. Rohwer and Vincent A. Fritz from the University of Minnesota evaluated the effects of black plastic mulch, P- and N-containing transplant fertilizer solutions, and combinations of mulch and transplant solutions for increasing and accelerating tomato yield in a fine-texture clay loam soil with little preexisting need for P fertilizers. The study appears in the August 2016 issue of HortTechnology. "Our aim was to determine if the recommendations for transplant fertilizer solutions and plastic mulch are justified, and if the effects are interactive in a clay loam soil with moderate or high levels of existing phosphorus fertility and organic matter," the authors said. 'Plum Dandy' tomato was transplanted in two consecutive years into a field with high fertility. Treatments included black polyethylene mulch or no mulch, and transplant solution containing water, 320 mg/plant nitrogen, or 320 mg/plant nitrogen + 475 mg/plant phosphorus. Mulch was removed 26 to 28 days after transplanting to eliminate midseason and late season effects. Yield-promoting and maturity-hastening effects were shown in both years from transplant solutions containing both nitrogen and phosphorus (18% greater total ripe fruit weight than water control). Benefits were also shown for using early season black plastic mulch: tomatoes in mulch treatments had 24% greater total ripe fruit weight compared to those with no mulch. "Recommendations for gardeners and commercial growers in Minnesota to use P-containing transplant solutions seem justified, even in moderate- to high-fertility soils," Rohwer and Fritz said. "Plastic mulch also enhanced early and total yield independent of transplant solution, presumably through increased root-zone temperature." The authors recommend transplant solution and mulch treatments be implemented together to reduce the risk of yield loss in weather-shortened seasons. 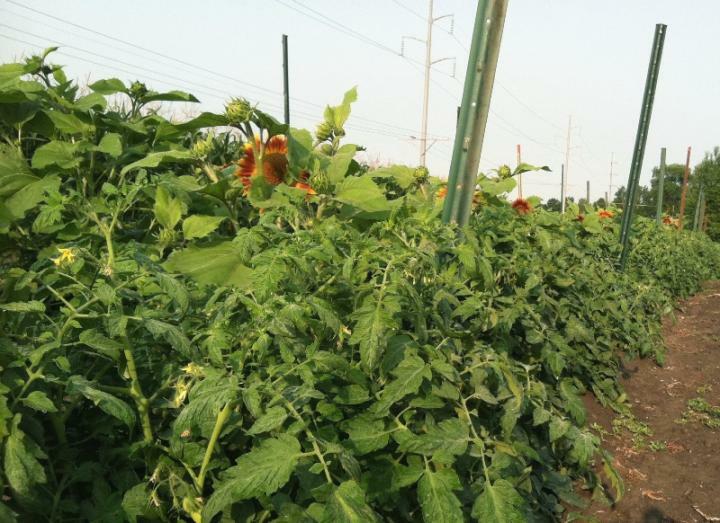 The study summarizes fertilizer recommendations for three different types of tomato growers: local (Minnesota) or regional (midwestern United States) commercial growers, or local gardeners.